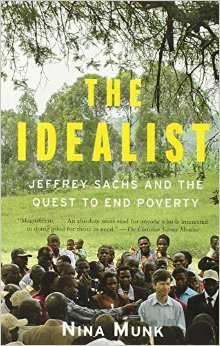 Jeffrey Sachs is a world-famous economist known for his passionate advocacy on behalf of the world’s poor. In his book, The End of Poverty, and elsewhere he has argued for massive increases in foreign aid to alleviate poverty and foster economic development in Africa and elsewhere. He successfully persuaded governments, non-governmental organizations, and rich donors to pour millions of dollars into “Millennial Villages” in Africa to demonstrate what could happen if only the resources were made available to help end poverty now. The Idealist is a sober look at Sachs by journalist Nina Munk. She looks at what actually happened in the villages and how the best of intentions and a lot of money can fail to deliver what is promised. This powerful book is sure to change your outlook on foreign aid and its ability to improve conditions in developing countries.